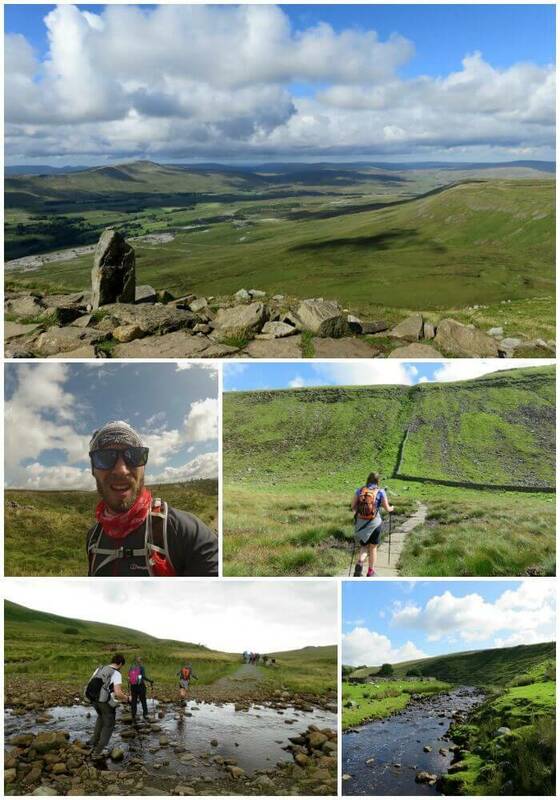 Last weekend, seven intrepid giants travelled to the scenic Dales to tackle the Yorkshire Three Peaks Challenge to raise money for our 2015 charities, the Pilgrims Hospices and Cancer Research UK. We have raised almost £1,000 for the charities since July 2015 through this challenge and Dan’s Great London Swim. The Yorkshire Three Peaks may be less infamous than the national Three Peaks but it is just as gruelling. Rather than climbing three mountains around the country in 24 hours, you have to climb three as part of a 24 mile trek in under 12 hours. This is the second year running that an SGM team has undertaken the challenge. Read about our 2014 challenge here. This year, the weather was much more favourable for hiking and both the walking and running teams were able to improve on last year’s times. The team of four walkers completed the challenge in 10.5 hours and the three runners achieved a fantastic time of 6.5 hours. 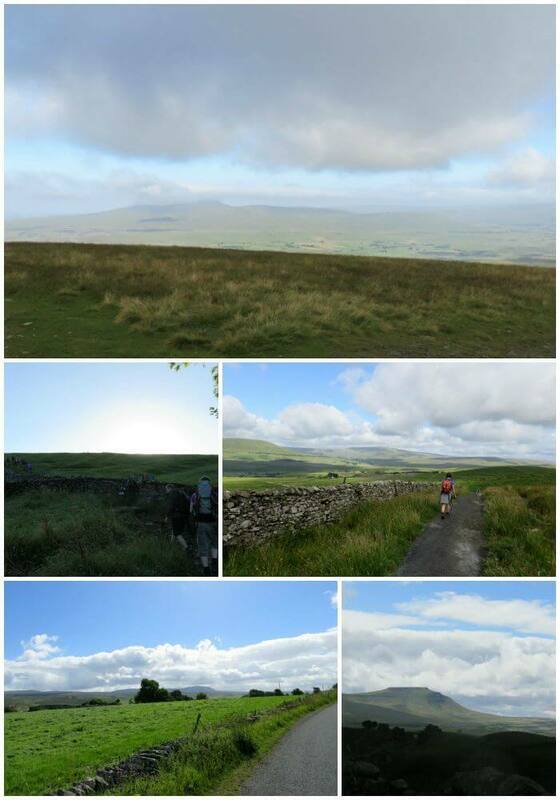 There’s no doubt the Yorkshire Three Peaks is a popular challenge. The team started at 7.15am, along with many others, to make the most of the cooler weather. The summit of the first peak, Pen-y-ghent, hides so you think you’re almost there only to reach the brow of the hill and realise there’s a whole lot more mountain to climb. The view from the summit is stunning. It’s only when you’re up the mountain that you realise quite how high up you are! The long trek between peaks one and two gives you plenty of time to take in the breathtaking scenery of the Yorkshire Dales. 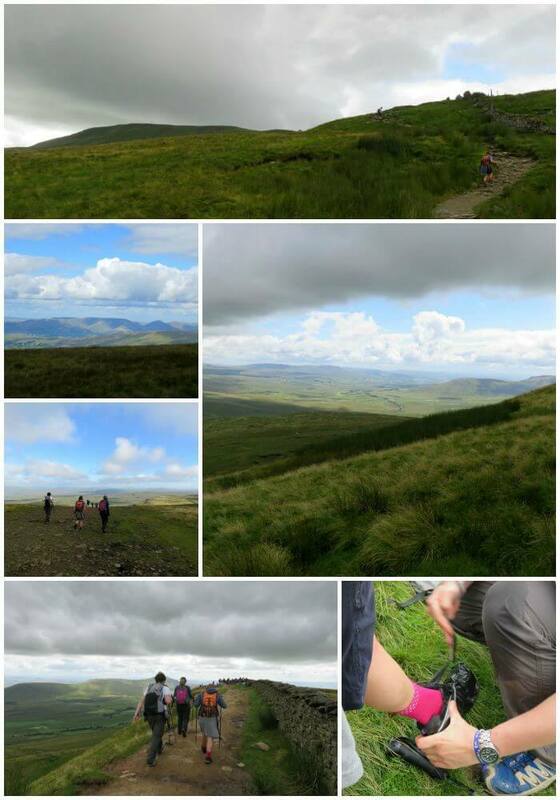 The path up to Whernside, peak two, was a GIANT mission. The path climbs up the back of the mountain before levelling out at the summit. As you ascend, the valley floor opens out below you and you can just about see the Ribblehead viaduct. It looks tiny from up here. The team couldn’t admire the view from the summit for too long because there was still one more peak to tackle. Ingleborough is the final peak and to get to the summit involves clambering up that hill! Lucy took the lead and soon the team had made it to the summit of the final mountain. By now the running team were definitely starting to feel the pain. Climbing peak three was the hardest part for Anthony, one of the runners. He was fighting off cramp in both legs whilst trying to keep moving and not lose too much time. But reaching the top of peak three isn’t the finish line, there’s still over three miles to go in order to complete the circular route so after a very short rest the team pushed on. Unfortunately, Lee started to suffer with his knee and found the last two kilometres very tough and slow. Well done to Luke, Anthony, Lee, Sean, Lucy, Tom and Justine! You did an amazing job. 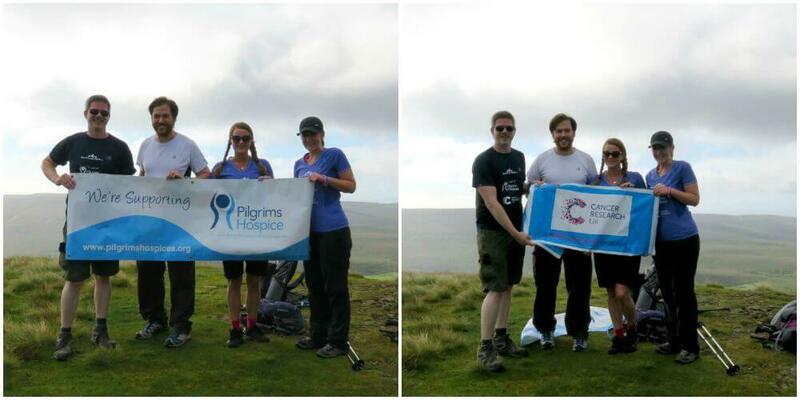 Over the next year we aim to raise £1,500 for Pilgrims Hospices and £3,500 for Cancer Research UK. We’re planning numerous events over the year and will need your support to reach our target. Visit our charity page to see what’s in store and to find out how to donate.